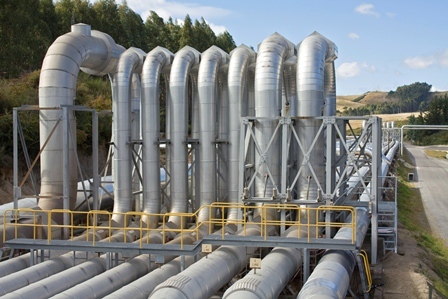 Four states – California, Nevada, Hawaii and Utah – each have geothermal power plants. North Dakota may have great potential in the area of geothermal energy with our vast oil resources in the western part of the state. As developers and drillers figure out ways to recover more oil from our reserves, researchers are working to find ways to create enhanced geothermal systems utilizing oil field waters to generate electric power. The University of North Dakota Petroleum Research Center is currently studying geothermal applications in North Dakota. The center, via grant funding from U.S. Department of Energy, the North Dakota Renewable Energy Program, Basin Electric Power Cooperative, and Montana-Dakota Utilities, installed two Organic Rankine Cycle (ORC) engines at a Continental Resources oil well in Bowman County. The ORC engines use hot fluid at the well site to generate geothermal electricity. The engines were commissioned in April 2016 and ran according to plan until the engines failed due to mechanical errors. Each engine can generate up to 125 kW of power, producing a total of 250 kW. Once the project would resume, faculty and students will conduct research for two years at the demonstration site on power and reliability to develop engineering and economic models for geothermal ORC energy production. Geothermal heat pumps – or ground source heat pumps – are being utilized more and more in the residential, commercial and institutional sectors as an efficient, renewable alternative for heating and cooling. The systems work by concentrating heat that occurs naturally, rather than producing heat and distributing it through structures. Click here for a business directory of accredited installers, trainers, and designers.